Our podiatrist is fully qualified and HCPC registered and has over 25 years' experience. She has a caring and professional approach to all of her patients. Clinic appointments are given full time and there is no feeling of being rushed. 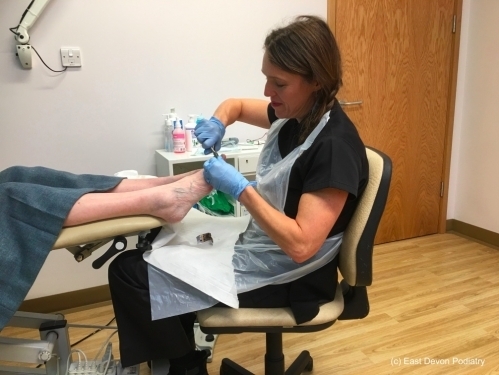 She can offer treatment for a wide range of foot conditions, from simple nail cutting and routine podiatry, to verruca treatment, removal of corns and callus, biomechanical assessment and orthotic insoles. Experienced, caring professional - I would highly recommend Sue is an experienced, caring professional, whom I would highly recommended to anyone ,like me, who suffers with foot problems. I have rheumatoid arthritis in both my feet, but with regular, expert attention from Sue I &lsquo;ve been able to retain my mobility and live independently.